Entomologists (biologists who study insects) use the Latin plural exuviae to designate the cast-off exoskeleton of an insect that has molted. While I was photographing in a shaded area along Bull Creek on July 7th I came across the exuviae of what I take to be a cicada (genus Tibicen). Sloughed-off “skins” can be as dirty as the one you see here, but then if you hung out on a leaf for weeks on end you might get pretty dirty too (or should I say ugly dirty rather than pretty dirty?). If some of that dirt came off, the exoskeleton would probably look very pretty. I’ve seen some exuviae that are a lot cleaner than others, and I’ve heard that some species get dirtier than others in the process of molting. Awesomely cool photo but ewwwwwww! My father used to use the expression “a face that only a mother could love.” Maybe this is an exoskeleton that only a mother cicada could love. This is such a terrific photo. I wonder if you happened to catch the first shedding after the cicada emerged from underground. That might explain the dirt. I’ve never seen one that had such a coating – it’s a nice “plus” for the photo. I do love the sound of cicadas: so much so that I once wrote a little haiku for them. I like your hypothesis: what starts out dirtier ends up dirtier. I seem to recall that when I was wandering along the creek that day I heard only the silence of the trees and no thrumming, although it’s possible I was so caught up in the visual world that I tuned out the acoustic one. Well, you certainly got up close and personal. Remember: beauty is only “shell” deep. The closer and personaler the better, Sally; that’s my usual attitude. Beyond exuviae and the occasional snail, I wish there were some real shells here to photograph, but Austin is about 4 hours from the nearest ocean. You’ve reminded me that the other day I found a box of shells from various excursions. I want to do a photo collage of small shell forms that I keep, and there are lots. Shells are such marvels of nature. You’ll have to take some trips to the nearest or farthest beaches to admire these gems. We’ll see what you “shell out” on the subject in future posts, Sally. Yes, I ought to get over to the coast. Very cool Steve!! Certainly has a cicada look about it. It does preserve much of the appearance of a living cicada. Your “cool” reminds me that we’re well into summer now, which can be summarized with one word: hot. We get high humidity too, alas. I wish I could take more credit for rarity, Nora, but exuviae of the sort you see here aren’t all that rare in Austin. No thanks…I like vanilla and mint chip. I can’t process the chemistry in your comment, but your mention of ecdysis and ecdysone reminds me that H.L. Mencken turned to the same Greek root to create ecdysiast as a fancy term for a stripper (or ‘striptease artist,’ as the American Heritage Dictionary more loftily puts it). I wish you a happy return to your regular self. Love learning that little tidbit about an ecdysiast! Now I’ve got to use it somehow, so that I’ll remember it…..
Maybe instead of referring to trees that shed their leaves in the fall as deciduous, which is the normal term, you can start calling them ecdysiasts. What an exquisite close shot, it is “pretty ugly” but fascinating to look the bug in the eye! And what big eyes it has. I think your “pretty ugly” summarizes most people’s feelings, Eva. I carried this exuviae of a Tibicen dorsatus home with me from the Flint Hills. I found it near the Tallgrass Prairie bottomlands. Its wings have lost just a bit at their tips, but he’s holding up pretty well. I was wondering if each species has its own song. I think the answer must be yes. Here’s a neat clip of two species having a little duet, also in Kansas. That’s a neat souvenir from Kansas. I know so little about insects, but I have the impression that your specimen, with its colors and features and wing details, is the remains of a whole cicada, as opposed to a cast-off exoskeleton. What do you think? It makes sense to me that each species of cicada would have a distinctive song, the better to attract mates of the same kind. I think you’re exactly right. I just browsed some images of exoskeletons. They have feet and legs, just as mine does, but they certainly don’t have wings. I have an example of Tibicen dessicatus! On the other hand, if I hadn’t been wrong, I wouldn’t have browsed all those photos and seen some really detailed closeups of cicadas splitting their exoskeleton and crawling out. I think I know where some of the horror movie folks are getting their ideas. Right here on earth we have some pretty weird life forms (with plenty of new ones found every year), so I think you’re right that some creators of horror stories and movies probably drew their inspiration from at least some of those creatures. If not, then there’s wealth of weirdness just waiting to be exploited. 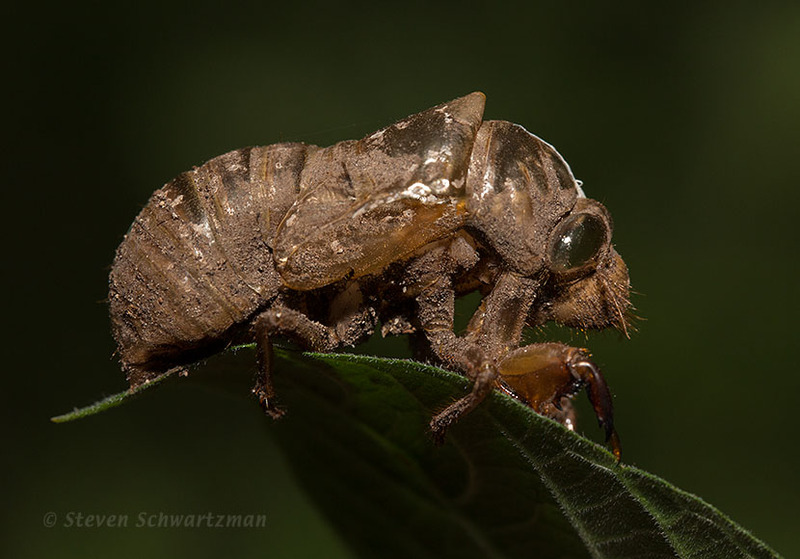 To find cicadas molting into adult form or having just molted (they’ll be very pale), I’ve had pretty good luck looking on tree trunks and lower branches early in the morning at this time of year. They seem to time their ecdysis for the nighttime hours… which makes sense. Thanks for that early morning tip. Cool. I like finding these too. Previously used vessels! Yes, and available at bargain prices, too. I’m not surprised, given that you’re not all that far from Austin.